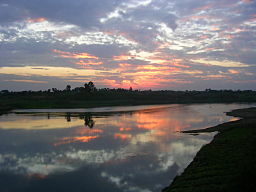 BHOPAL: Campaign to free the state’s lifeline Narmada River from pollution will be launched with people’s cooperation. The campaign will begin from Narmada River’s originating point Amarkantak on Dev Uthhni Gyaras. Chief Minister Shivraj Singh Chouhan announced that water of Narmada will be made available to entire Malwa region. An action plan is being chalked out for this. Malwa region will get water for irrigation in eight lakh hectare area and drinking. Water will also be supplied to industries. Paucity of funds will not be allowed in the implementation of scheme. Chouhan addressed a function held to launch City Forest and Diversity Park to be developed by Indore Municipal Corporation (IMC) in 30 acre area at Bichauli Hapsi at Indore on Sunday. The park will be developed at a cost of 5.50 crore. Chouhan said that Narmada is the lifeline of Madhya Pradesh. It will be saved from pollution at any cost. He said that constant sinking of water table in Malwa region is a matter of concern. Narmada water will be reached out to every area of Malwa. An action plan is being chalked out for this. Paucity of funds will not be allowed to come in the way. He appealed to citizens to plant maximum saplings, especially in Malwa region and participate in water conservation and augmentation activities. Commerce and industries minister Kailash Vijayvargiya, minister of state for health Mahendra Hardia, member of parliament Sumitra Mahajan, Indore Mayor Krishna Murari Moghe, MLAs and other people’s representatives were present on the occasion.